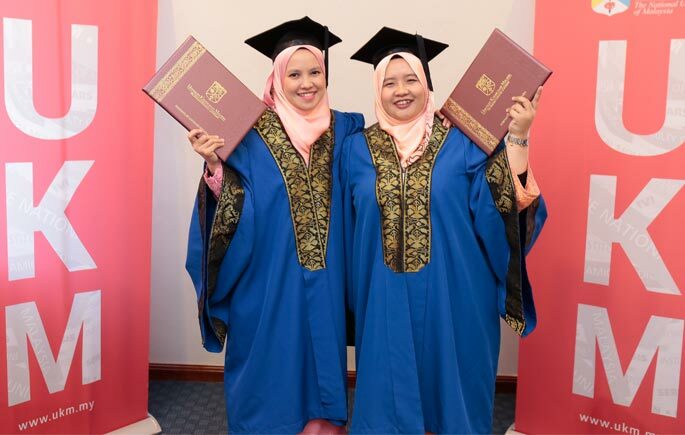 BANGI, November 13, 2018 – Sharing the same stage of success in the 46th Universiti Kebangsaan Malaysia (UKM) Convocation Ceremony was the proudest moment for Mazni Abdullah, 28, and Nur Amrina Abdullah, 26. Those who earn Master of Business Administration (MBA) does not make their busy work as a barrier to success. Nor Mazni said that during the period of the study she was always studying with her sister. “We will spend time in the library after we finished our classes. Since Nur Amrina is not from a business study during Bachelor’s degree, so we need to focus more. I will help some things she does not understand, “said Nor Mazni who earned Cumulative Grade Point Average (CGPA) of 3.56. She said with the determination and never-ending support from the family, they were able to graduate successfully. Nur Amrina, who earned PNGK 3.65, said that she took the challenge of her sister to pursue her studies in the business field. “Alhamdulillah, my sister helped me a lot during our studies. Although business was not my field before, thanks to the group study that we did, I was able to prove it with this success,” she said. Nor Mazni currently works as Assistant Manager at Bank Muamalat, Kuala Lumpur while Nor Amrina is a Science Officer at the Malaysian Meteorological Institute, Petaling Jaya. Meanwhile, this siblings, Aizuddin Saharuddin 34, and Muhd Dhiyauddin, 30, also celebrated their success at the convocation ceremony. Muhd Aizuddin said he went through difficult times when he received a letter from the faculty to stopped him from continuing his studies because of examination results did not reach the level of approval. “I was disappointed with the decision. I appeal to continue my studies. Alhamdulillah, my appeal was accepted and I started a new determination to achieve the success, ” he said, earned a Master’s Degree in Education of Administration. His younger brother, Muhd Dhiyauddin, who earned an MBA degree, said he would study after letting his son sleep at night and reviewing one topic for a subject in the dawn. “Time management is very important. Since I’m working and have my own family, I have to be good at managing my time so that families do not get ignored, and my study will go smoothly,” he said.